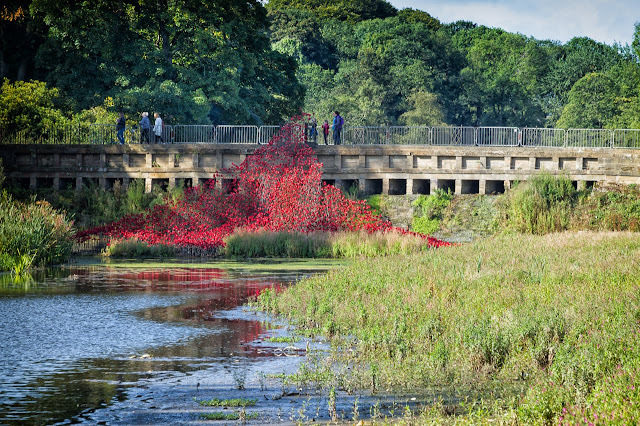 A few days after the Poppy wave was unveiled at the Yorkshire Sculpture Park in September I managed to get out and take a few photographs in the sunshine. 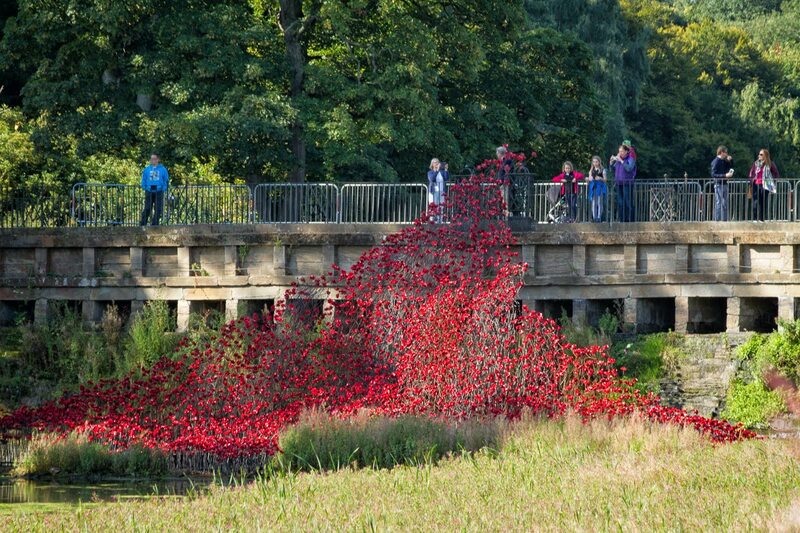 This installation at the park was a part of the poppy display from around the Tower of London that is on tour over the next year I believe. In a previous post I had promised that I would include these photographs in a later post, so here they are. 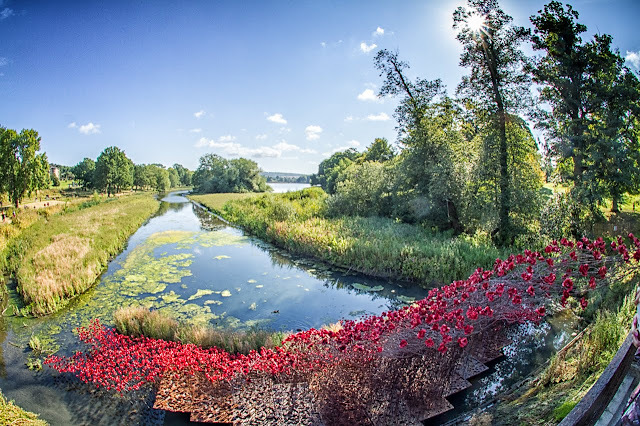 This first photograph was taken from the footpath approaching the bridge between the lower and upper lakes at the park. This had been recommended to us as the best way to go to get a good view of the poppy wave. The water level in the lake was quite low because of some repair work taking place on the dam wall so there is a lot of weed growing on the exposed bed of the lake, but still enough water to get a bit of reflection of the poppies. As we got closer the detail in the poppy wave became easier to see and also the extent of the weeds. It is a shame really because this would have looked much better with the sculpture reflected on the lake with more water in it. On my more recent visit here there is even less water in the lake as the repair work continues. Normally there is also a nice cascade of water coming under the bridge which would added even more interest to the scene. Here we are looking down from the bridge over the top of the poppies towards the edge of the display. The light patch to the right go the photo is the reflection of the sun in the water where there is also part of the base of the structure of the sculpture. 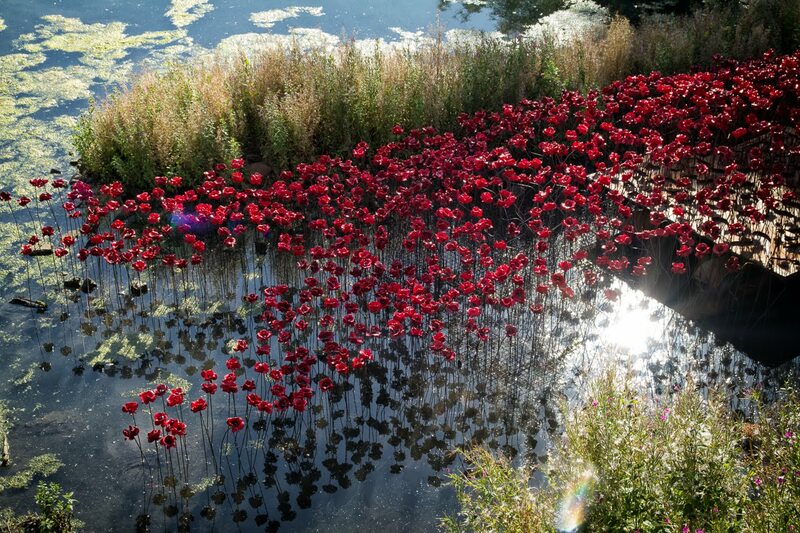 I suspect that had the water level in the lake had been normal that the base would have been under the water and these poppies below would have had there heads just poking out of the water. I used my fisheye lens to take this shot looking over the bridge and down the channel between the beds of weeds. Normally the water would extend to the pathway you can see on the left where people are walking towards the bridge and up to the base of the trees on the right. I also managed to get a sunburst effect of the sun through the trees on the top right which I quite like. 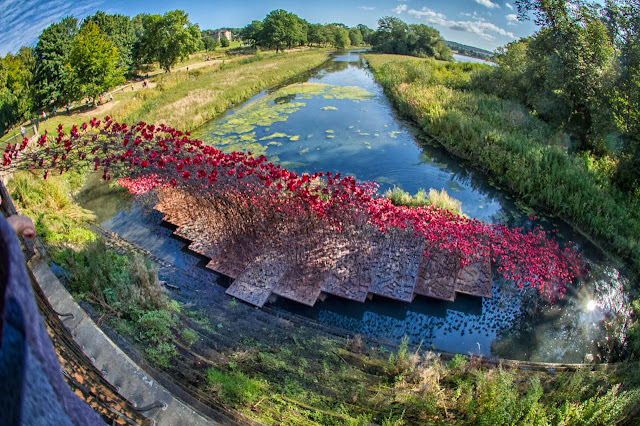 This last photo is again with the fisheye lens and looking down from the bridge but this time from the other side of the sculpture. The top end of the wave comes over the top rail of the bridge but by now there were quite a few people on the bridge and very close to the top end so I couldn't get a decent shot of the top end because of them. I managed to get another sunburst effect, this time in the reflection of the sun in the bottom right of the photo. I think the Poppy Wave is at the park until the second week in January and I was hoping to get some shots of it with either snow or ice on it but the weather has been so mild this year I can't see that is going to happen. Never mind, it was nice to get these shots of it in the sunshine at the beginning of September.